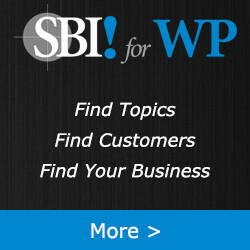 SiteSell 25% Off on SBI for WordPress Yearly Plan Coupon Code. SBI for WP offers you web-based learning, online tools, and a WordPress plugin that integrates your research and findings into your WordPress website. It will help you in finding topics and customers for your business. It includes unlimited use of the Master Keyword List, integration with one WordPress implementation with unlimited Target Keyword selection, and an allowance of 25 search credits which are depleted only as searches are performed. Your Master Keyword List can contain up to 5000 keywords generated through Brainstorms. SiteSell is a privately held, Canadian based company and was founded in 1997.